While the economic recovery continues to be sluggish, there is a bright spot in the automobile sector which reported auto sales this past August were the best since before the 2007-2009 recession hit. Auto sales were 20% higher compared to the same time period last year with total sales for the month at 1,285,202 vehicles, according to Autodata Corp. Many consumers find the early fall an ideal time to shop for a new car, as the automakers are bringing in the next year's new models and often have attractive incentives and special financing terms both on last year's leftover stock and the new models. If you are considering purchase and financing an automobile in the near term, doing some homework upfront can help you secure more favorable pricing and financing terms that can potentially save you hundreds of dollars. First, identify the cars you're interested in and research the list price and dealer costs for features you want in your car. There are many websites and reference materials where this information can be found. Knowing this information can help you more confidentially negotiate the final price you are willing to pay. Second, know your credit status so you have a better understanding your likelihood of being approved for the financing, and at what cost (the interest rate charged by the lender). Obtain a copy of your credit report/credit score to ensure the information contained on the credit report is accurate and up to date. To be safe, you should try to do this at least 30 days before you plan to purchase the car as it gives you enough time to get information corrected if errors are present. You can access your credit report from a variety of sources, including www.annualcreditreport.com. You can also check your credit score for free using Credit.com's Credit Report Card. Evaluate your credit score and understand what your credit rating translates to in terms of your potential cost of borrowing. The chart below helps you understand how having a higher credit score can translate into big savings. 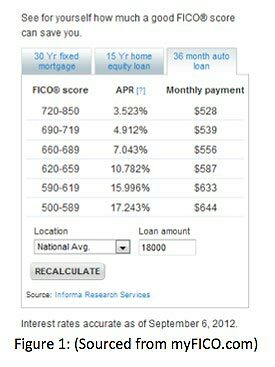 The figure shows the average national interest rate for a 36-month auto loan by FICO score bands. Higher scores equate to lower interest rates (3.5%) and lower scores trend towards higher interest rates (17.2%) on average. Assume two consumers are applying for an $18,000, 36 month auto loan. Consumer A has a FICO score of 650 and Consumer B has a FICO score of 750. How much savings can the higher score provide in this example? The consumer with the higher FICO score has a monthly car payment about $60 less compared to consumer B and will save over $2,000 over the life of the loan — savings that can help cover the increased cost of insuring a new car. If you see that your score is not as high as you would like, carefully read the educational information that comes with the credit report and score you ordered. Usually, there are action items listed indicating where you need to focus your actions to increase your score. Generally speaking, there are no "quick fixes" to substantially increase your score, so it may take time to get it to the level you want for you to realize big savings. Car shopping is often listed as one of the least like activities in the U.S. Hopefully, being prepared ahead of time can help make it a less stressful experience. Credit.com's Consumer Credit Expert, Tom Quinn shares invaluable insight to navigating the often complicated world of credit scoring, credit reporting and credit granting industry practices. Formerly with FICO (Fair Isaac), MDS (now Experian) and Citibank, Tom has more than 20 years of experience in the credit industry and is currently Vice President of Scoring at Nomis Solutions. Reach Tom at creditexperts@credit.com.